These are a necessary evil. We've tried a few different models and these seem to work the best. At best, folks find them unruly. At worst, they end up carrying both the canoe and cart over the trail. There is a trick to strapping them to your canoe, but the debate is still open whether to push or pull. 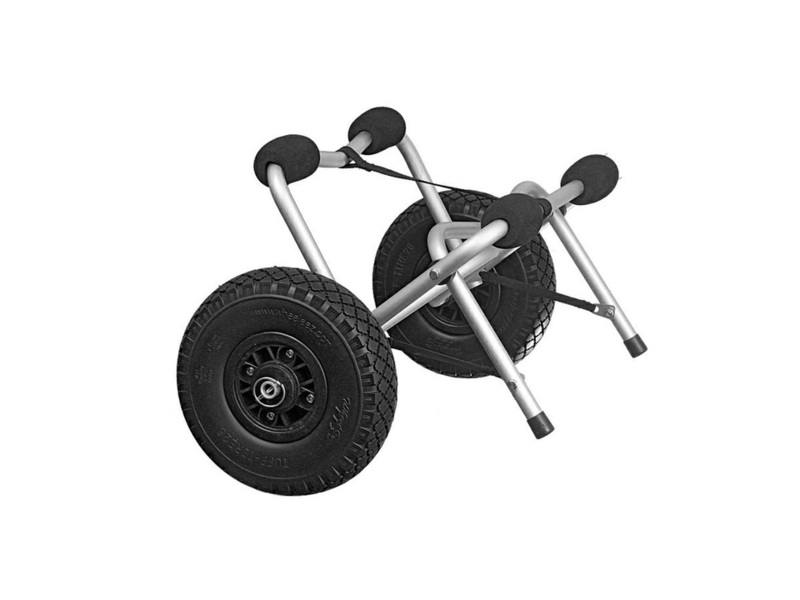 Please note, the carrying capacity of the portage wheels is about 110lbs. Our heavy polyethylene boats are 80lbs -105lbs which doesn't leave much wiggle room. Please do not use your canoe as a wheelbarrow- this may break the portage cart, and will definitely put a huge dent in the canoe. What I mean by this is, do not plan on strapping the wheels to your cart and loading your canoe with equipment to push across the portage trail. Not to sound stern, but if your canoe comes back with a dent in the bottom, you may have just purchased a canoe for yourself. We really only permit these wheels if you're portaging with a heavy polyethylene boat. We do not allow portage wheels to be used with our Royalex canoes. This is to ensure the most effective distribution of our portage-enabling resources. If you're a solo paddler and you would like to discuss options, please reach out to us! This rental includes the cart and two straps for attaching the wheels to your canoe.